I co-run baseball fall ball clinics for local high schools. It lasts for about a 12 wks and the purpose is to receive baseball instruction and repitition during the off-season. The players have games on the weekends and spend 3 days during the week working with us. Yesterday the agenda was at 6-7pm (optional defensive work) and at 7-8pm (optional hitting)…Tuesdays and Thursdays are the preferred days that all players come. Getting to my story – yesterday for optional fielding only one students showed up. I was fairly surprised – these kids need work! I was happy that the one player was actually a first baseman – freshman, large frame but very “raw.” Who knows where he’ll end up in 4 years but as of now, he’s truly a freshman (a big freshman). Yesterday we worked on footwork while turning two – playing behind the runner. Many young players make all infield play two fold – first they field the ball flat footed then make a jump turn to exchange and throw. 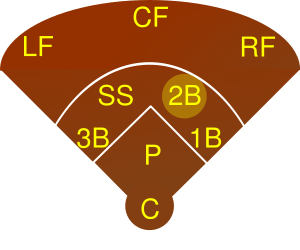 At this point there has to be a transition where they are making this play in one motion…speeding up their side of it giving the middle infielder a chance to make a play. The key for young first baseman is the round the ball and plant your left foot slightly in from of the right as you are fielding so that your body is in position to make that turn and throw (with momentum towards your target)…His ability to mimick increased – I think it says something about his ethic that he put in the work. I asked him about his classes and grades…he has a 4.0 and is taking Algebra Trig already — I think he’s got the right mind frame. Whether or not that transitions to success in baseball, his work ethic is off to a good start. Oh Yeah….at 7pm — 11 players showed up to hit. If you can’t play in the field – you won’t be hitting. High school DH’s don’t last long.